Hall of Fame quarterback and current FOX announcer Troy Aikman lays claim to the above quote after speaking it into existence during the Los Angeles Rams’ win over the Dallas Cowboys on Saturday. With other high-profile wide receivers (i.e., Julio Jones, Michael Thomas, DeAndre Hopkins) still walking the earth, Aikman’s high praise for Woods drew expected disdain across the Twitterverse, but he didn’t completely miss the mark considering that Woods is indeed playing at an outstanding level in 2018. Woods finished the regular season with an 88.0 overall grade, which ranked eighth among the 99 NFL wideouts with at least 400 offensive snaps played in 2018, and it marks a career-high for the six-year USC product. He had previously earned single-season grades of 71.4 or lower in his four years with the Buffalo Bills (2013-16) and a 79.1 overall grade in his first year with the Rams in 2017. 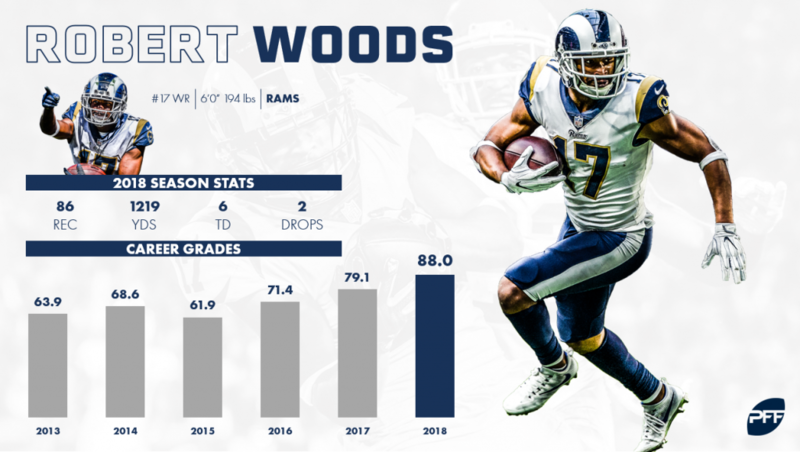 Though he was similarly efficient in 2017, Woods maintained high-end efficiency while beefing up his workload significantly. The 26-year-old veteran averaged 2.05 yards per route run and recorded a 67.7% catch rate across his 595 routes run and 127 targets. He also recorded a reception of 15-plus yards on 41.9% of his receptions in 2018, good for the 12th-highest percentage among wide receivers with 30 or more receptions this past season. Woods, along with teammate Brandin Cooks, thrived within Los Angeles’ play-action-heavy offensive scheme. No two receivers ran more routes on play-action dropbacks than Cooks and Woods in 2018, and duo proved highly efficient, as well. Woods averaged 2.55 yards per route run and recorded a 118.8 passer rating on such routes during the regular season, while Cooks finished at 2.82 and 135.4, respectively. Cooks’ role in Woods’ ascent is evident, as his proven speed, big-play ability and sure-handedness kept defenses from dialing in on Woods for most of the year. Cooks averaged 2.07 yards per route run, recorded a 115.9 passer rating when targeted and dropped just one of his catchable targets in 2018. Woods’ ability to play at a high level both from the slot and along the boundary often gets overlooked, as well. Playing 55.3% of his receiving snaps from the slot, Woods averaged 1.60 yards per route run, ranking 10th among the 32 receivers with at least 200 routes run from the slot in the regular season. Lined up at outside receiver, Woods averaged 2.52 yards per route run, ranking fifth among the 67 NFL wideouts with at least 200 routes run along the boundary. Though he doesn’t have blazing speed or quickness, Woods has found ways to get open against man coverage as he continues to develop his skillset in the NFL. Against cover-0, cover-1 and 2-man looks in 2018, Woods averaged 2.28 yards per route run, ranking 15th among qualifiers. Even if he isn’t the receiver Aikman thinks he is, Woods and the Rams’ offense will continue roll like they have all season.